The ultimate April Profile 2016 - OH MY KPOP! She was born on November 8, 1997. Chaewon is the main vocalist of the group. She was born on February 5, 1998. Hyunjoo is a vocalist and main dancer of the group. Her weight is 46 kg. She was born on May 5, 1999. 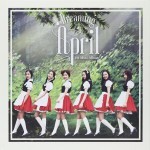 Naeun is a vocalist of April. Her weight is 43 kg. Naeun appeared in in GOT7’s “Stop Stop It” music video. She was born on December 4, 2001. Jinsol is the maknae of April. Jinsol used to be trainee at JYP Entertainment. She is best friends with Chaeyoung from Twice. She was born on May 22, 2000. Yena is the lead dancer of the group. She was born on August 22, 1996. Somin is the leader of April. April are managed by DSP Media. They released their first album “Dreaming” on August 24, 2015. The group won the Female Rookie of the Year Award 2016. Somin left the group on November 9, 2015. The April members appeared on a couple of Korean dramas and TV shows. You can find concerts dates and April events here. We hope our April profile answered all the questions you had about this wonderful Kpop girl group. If not, please let us know in the comments.